audiorate sequencers, eg to be used with the RackSynth1 device. Clock: selectable start bar and length (range 1-16). You have to connect the Ramp's clk out to the clk in of the Sequencer devices below to make them working. GateSeq: Step length can be set to a fixed value, or to individual length values. ControlSeq Notes: outputs note values in range of -/+24 steps. Glide can be set to a fixed value, or to individual values. ControlSeq Unipolar: outputs unipolar control values. ControlSeq Bipolar: outputs bipolar control values. SeqClock Visualizer: shows clock activity. 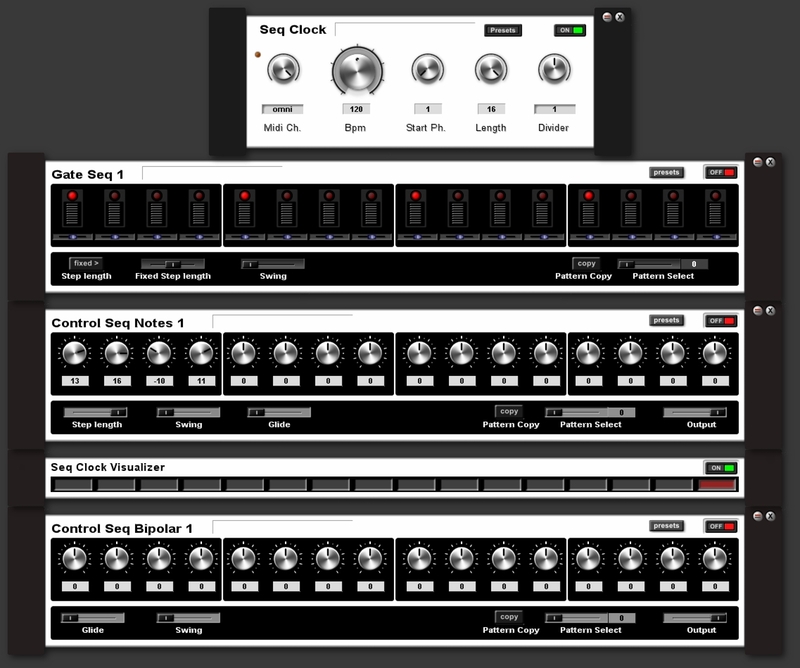 All sequencer devices have Swing control, controls for pattern copy/paste, and a textfield for notes. To avoid speaker damage by auto-connecting the devices to mixer, all devices are set to Off by default (button top right). Don't connect the output of any of these devices to a mixer! It's low voltage signals can hurt your gear and ears.